Four fifths of the inhabitants of Dresden do not belong to any religious community. Approx. 20 % of the population is predominantly Christian. Etwa vier Fünftel der Einwohner gehören keiner religiösen Gemeinschaft an. Etwa 20 % der Stadtbevölkerung setzt sich mehrheitlich aus Angehörigen christlicher Konfessionen zusammen. I expected the majority of Dresden inhabitants to be either Catholics or Protestants. According to this article, most of them (80 %) are not officially religious. What events led to this? Why are 80 % of Dresden inhabitants atheists, agnostics, or "spiritual, but not religious"? the Russians were exposed to atheist propaganda longer than Eastern Germans (1991 - 1917 = 74 years in Russia vs. 44 years in Eastern Germany). If this logic is correct, there must be a lower percentage of Christians in Russia than in Dresden. However, Wikipedia says that 41 % of Russians are Russian Orthodox, i. e. belong to a religious community that was persecuted the strongest during socialism. This means there are more than twice as many Christians in Russia (41 % Russian Orthodox, 47.1 %, if you count all Christian confessions) than in Dresden (20 %). Therefore my original hypothesis is wrong (does not explain the low number of religious people in Dresden). Leipzig: 80 % of the population do not belong to any religious tradition (German: Heute gehören 80 % der Bevölkerung keiner Religion an.). Chemnitz: In 2007, 80 % of the population did not belong to any religion (Etwa 80 Prozent der Bevölkerung gehörten 2007 keiner Religion an.). Rostock: In 2016, 10 % of the population were Protestants and 3.2 % Catholic. The vast majority of Rostock inhabitants is irreligious (Im Jahr 2016 waren 10 % der Rostocker Bevölkerung evangelisch und 3,2 % katholisch. Die große Mehrheit der Rostocker ist hingegen konfessionslos.). Erfurt: In a representative household poll by the Erfurt's statistical authority in 2011, 11 % of people said they were religious, and 81 % non-religous. In the cohort of people between 18 and 24 years old these numbers were 9 % and 88 %. In the cohort of people over 65 years, these were 14 % and 70 %. According to official data (Melderegister) of 2010, 13.7 % of population were Protestant, 6.5 % Roman-Catholic, 0.2 % Jewish, and 0.8 % belonged to a different religious tradition. (In der repräsentativen Haushaltebefragung der Erfurter Statistikstelle für 2011 bezeichneten sich 11 % der Befragten als religiös und 81 % als nicht religiös. Bei den 18- bis 24-Jährigen waren es 9 % und 88 % und bei den über 65-Jährigen 14 % und 70 %. [...] Nach Melderegister waren zum 31. Dezember 2010 etwa 13,7 % der Bevölkerung evangelisch, rund 6,5 % römisch-katholisch, nur 0,2 % jüdisch und 0,8 % gehörten einer anderen registrierten Religionsgemeinschaft [...] an.). For the vast majority of Germans, religious and non-religious alike, religion matters little in daily life. In some families, the babies are baptised, marriages have both civil and religious ceremonies, and one goes to the service on Christmas and perhaps on Easter. Yet in a survey or opinion poll, these people might report themselves as Christian. This kind of low-key religious affilation changes only very slowly, over generations. Dresden is in the east of Germany, the former German Democratic Republic. Being a communist country, the GDR was somewhat hostile to religions. So the two generations of communism for Dresden accelerated a trend that can be seen all over Germany. Regarding Russia, the Orthodox faith played an important role in re-establishing a Russian national identity after the breakdown of communism. Most East Germans put their faith in the West German Mark (pride in economic accomplishment), instead. Follow-up: As user28434 mentioned in his comment, most major churches demand a 'membership fee' and signed treaties with the tax office to collect it. The only way to get out of paying is to formally leave the church congregation. Treaties between the churches and state cover chaplains in the armed forces, faith-based schools, religious education in public schools and teacher training for that in universities, and much more. 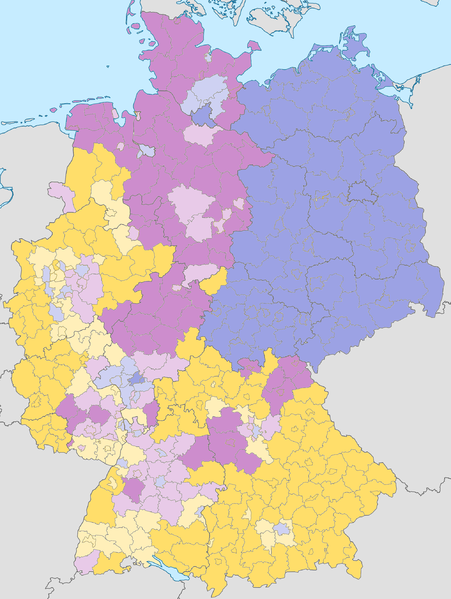 As you see, approximately one third is Roman-Catholic (yellow), one third is Lutheran (violet, this is not the same church like in the USA despite having the same roots!) and the former German Democratic Republic consisting mostly of atheists (East Germany). This has historical roots which explain many things which may seem strange to an outsider. During the Renaissance and the Reformation the predecessors of Germans lived in the Holy Roman Empire, a conglomerate of many different principalities in size. Those people experienced one of the worst religious persecutions (witch hunts) and the worst religious war, the Thirty Year War which killed one half (!!) of the population. This war left the surviving people with very deep psychological scars. This caused that religious extremism of any form was and is still despised. 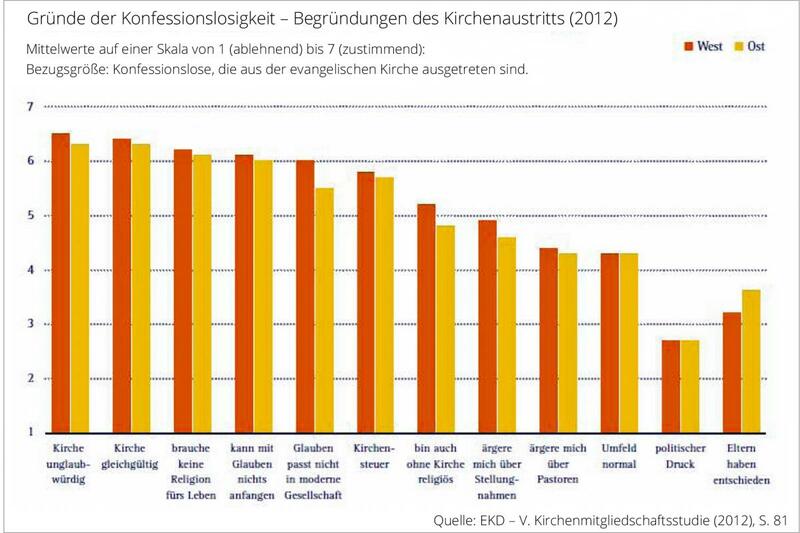 Peaceful coexistence of confessions is of utmost importance for Germans (I would say even on a subconscious level). Many German predecessors who left the Holy Empire and later the German Confederation for the USA were in fact zealots which were ostracized for their unaccomodating behavior. This explains the extreme insistence of the separation of church and state in the USA: The people were fervent believers which needed to defend their originality and define borders for that while the Germans removed conflict points. The religious education in schools and the non-allowance of private education in Germany's school system has several intentions. Sure, you can mention that it is convenient for the churches to indoctrinate young people (but it is not the place to discuss it), but I really think it has another reason. Its intention is to weed out religious extremism and increase tolerance by introducing young people to a disarmed version of religion. Kids are also discussing ethics and core questions (Death, Forgiving etc. etc.). And I would say that in fact it works; religious extremism is noticably absent in Germany; which is the core of a another reason, but more to that later. After the time of the great war religious separation in Germany began to soften considerably. While the churches tried to prevent interdenominational marriages it finally implemented denomination rules for marrying partners because it became more and more fruitless to forbid it. One of the incidents named Kölner Wirren (Cologne troubles) was the clash between Prussia and the Catholic Church when lutheran Prussian Soldiers married Catholic females from Cologne which was under Prussian government. When the Prussian authorities tried to subjugate the Catholic bishops, there was an uproar in the population which forced the government to retreat. It must also be said that German (and many other Western European) "Christians" are often having a very "light" version of Christian values, setting the priority of tolerance and taking conflicting passages either metaphorically or simply ignore them. The priority of avoiding conflict makes missionaries so confused about Germany: Their efforts to proselytize are politely ignored. This brings up the question how Germans react if someone tries to exploit people for religious reasons or claim that they are the holders of the single truth. In short: Very, very badly. After Scientology was getting public attention and tried to badmouth and sue people who critized them, it spectacularly and completely backfired. Scientology is now not only a pariah, Germany is one of the few countries which have a "Free Zone" teaching Scientology principles without the church which made the original church livid. The letter from celebrities which defended Scientology and compared them with the persecution of Jews 1997 was met here with utter and complete contempt. Metin Kaplan who tried to build an own "Caliphate State" in Cologne was arrested by the GSG-9, an anti-terror unit 1999 and extradited to Turkey 2004. In short, don't annoy Germans by trying to incite riots by religion. A Fred Phelps risks here a severe beating with coincidentally no witnesses. Another reason which explains such oddities as church tax is tradition: If a system works, Germans are reluctant to change it, ideological grounds are not sufficient. The church tax is a remnant of kings being responsible to support the church which was followed by the state. In the German Democratic Republic the socialistic view on churches at religion was that they are detrimental: The idea of an afterlife, forgiving and humility hinders the people to fight against exploitation. But the history explains why the GDR never tried to suppress churches completely, the risk of backfiring was simply too great. For that reason the influence of churches in East Germany which were at the start mostly Lutheran (violet) began to dwindle. Apart from teaching a materialistic and atheistic worldview in schools people who clung to the church were discriminated: They could not get leading positions or a secure position as Beamte (public officers). 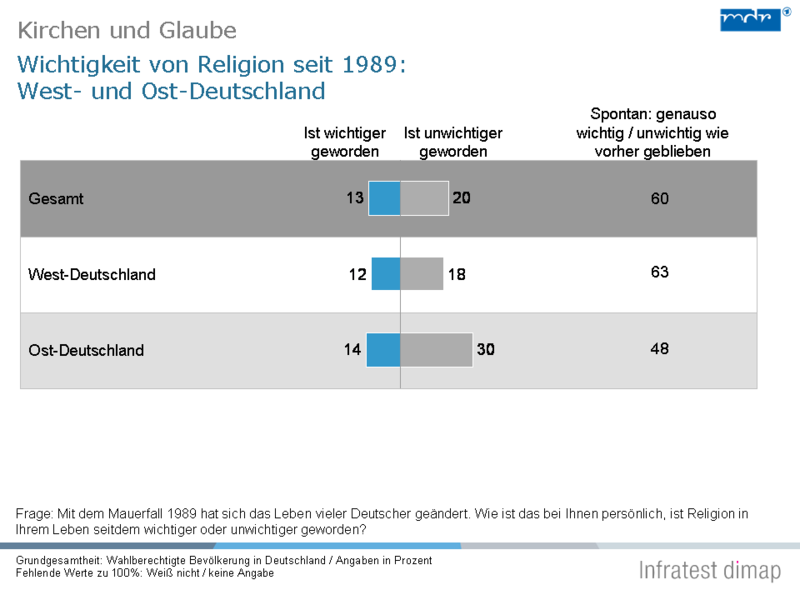 As religion is not an important part of identity for Germans most people simply switched to atheism. But churches were also observed and many clergymans were hostile to the GDR and played an important part in the later peaceful revolution. For that reason we have Christian religious education and church tax in Germany which would cause an US citizen to scream bloody murder. Here nobody blinks an eye. Religious affiliation: The information does not refer to religious conviction, but to legal affiliation to a church, religious or philosophical community. Around 49.4 million or 62.0% of all people in Germany are members of the two large public Christian religious societies. They belong to 50.3% (24.9 million) to the Roman Catholic Church and 49.7% (24.6 million) to the Evangelical Church. Orthodox churches (1.3%) rank third among the public religious societies by a clear margin, followed by the public Protestant free churches (0.9%). With a share of 0.1%, the Jewish communities represent only a small proportion of the public religious societies in Germany. Another 2.7% are committed to another public religious society. 33.0% of the respondents - including, for example, non-public Christian or Jewish communities - do not belong to a public religious society. 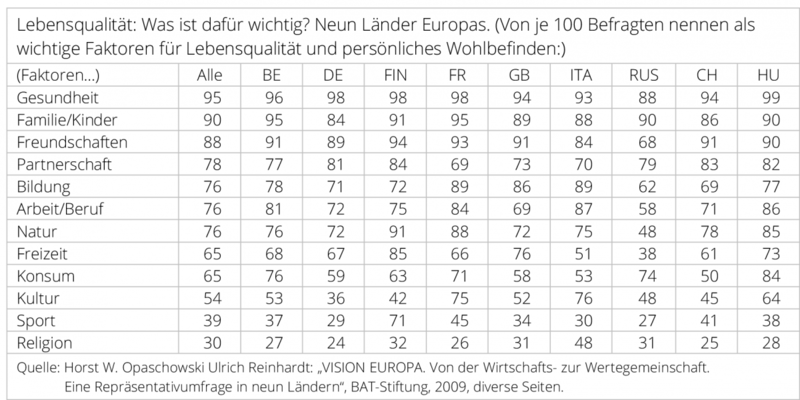 Source: Statistische Ämter des Bundes und der Länder, Zensus Kompakt, Ausgabe 2014, p 16. That means you might be religious, believe in God but not be a member of of one the officially sanctioned communities. That means as well that you might be a member of a sanctioned church, pay the church tax to the state and be a complete atheist. 28% of members of the protestant church are self-declared atheists. One valid and meaningful interpretation for the census checkbox "konfessionslos" would be "not paying church tax". For a long time you had to leave the church officially to get ahead in the GDR (joining a political party instead), while you might had to stay in church to get ahead in the West. This was only deemed illegal discrimination based on religious grounds recently. If your employer insisted on getting to know your religion and ensure you had the right one. This was even the norm if the employer was a church, like for example in a kindergarten or hospital. That is one reason for the biggest differences between East and West. But it sounds much more fundamental, when in reality the decline was not sharply divided by political boundaries along the iron curtain and also not so much dependent on Catholicism vs Protestantism. This is much more gradual over space and time. Spain, Italy remaining much more religious than Scandinavia, Germany, and even Poland and Russia. The personal attitude towards religion cannot be gathererd from official statistics like a census. For that topic you need a survey. Question asked: "Whether you go to church or not - would you say you are…"
This reveals atheists at a low 8% overall. Listing the reasons as the church itself being unbelievable, the church itself being indifferent as two factors bigger than being irreligious. And at the fifth position the ever so unpopular church tax that the state collects on behalf of the churches, if you are a registered memeber of the sanctioned churches. The question was: "With the fall of the Berlin Wall in 1989, the lives of many Germans have changed. How is that for you personally, has religion become more or less important in your life since then?" 60 percent say that it has remained the same for you, religion has become more important for 13 percent and less important for 20 percent. It is remarkable that in the eastern federal states those who say religion has become less important to them personally are 30 percent compared to 18 percent in the western federal states. The decline in the importance of religion, however, is in both the West and the East. That means while religion was relatively less important in the East when the wall came down, its decline in the East has even more accelerated compared to the West. In the German Democratic Republic the Christian churches had to face fierce discrimination by the state until 1961. These obstructions were attenuated after the wall was built and one reason for church attendance as 'high' as it was can be found in the role the churches and church communities played in opposing the party and system of the state. The number of Protestant Church members has decreased from 14,800,000 in 1950 to approximately 7,900,000 in 1977. The number of members of the Catholic minority Church has remained fairly constant, currently at 1,200,000 Church members (estimate by DDR Handbuch 1979; no official statistics are published). Religiosity in the postwar period and de-Christianization afterwards reached especially great proportions in Central Europe, whereas the religious revival in Central Europe after 1978 is unparalleled. Another distinguishing feature is the adaptation of church structure to conditions of totalitarianism by the `underground church'. Different interpretations of these features are examined. Secularization theory does not offer sufficient explanation, partly because totalitarianism counteracted sociocultural differentiation. The rational choice approach does not fit either, because both premodern attributes and the social confrontation with totalitarianism and the resulting bipolar arrangement of the sociocultural system contradicted market conditions. The best explanatory concept is found in acculturation which produced distinct patterns of religiosity in different age cohorts. - 1,3 % Bekenner anderer Religionen oder ohne Religionsbekenntnis. - 62,3 % haben ein anderes oder kein religiöses Bekenntnis. Statistics are collected differently in Russia and the numbers vary greatly. Looking at the highest number from recenzt years it reaches up to 80% calling themselves as Russian-Orthodox. But that is not an accurate picture. Attempts to examine the worldview of those people who call themselves orthodox usually ended with the statement that religious consciousness is dominated by "religious syncretism" and "eclecticism. In 2005, for example, 22 percent of the Russian population believed in the migration of souls, 42 percent in astrology, 19 percent shared the idea of a God "with whom man can establish personal relationships". According to D. Furman, religion has not defeated atheism in Russia, but religion and atheism both face the growth of ideological ambiguities and an ideological eclecticism that includes the belief in a "survival of the soul", astrology, ufology, "energetic vampires", magicians, shamans, etc., forming an unstructured form of constantly changing elements that are not logically connected. The more modernized countries of previously Communist Central Europe score, in belief and in religious practice significantly below non-Protestant Western countries. This non-belief contains no hostility against religion, but no special sympathy either. The young generation grew up simply without any convincing religious socialization and education. […] Social mechanisms for the transmission of faith are lost, too. 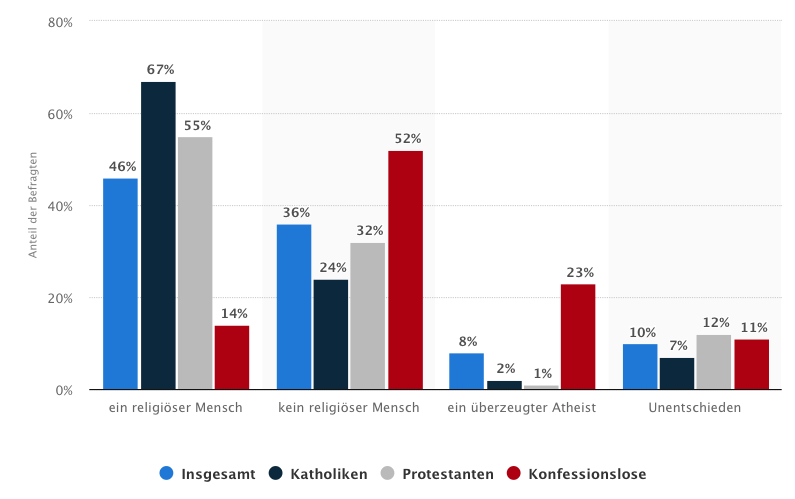 In another answer there is a quite often reproduced visual concerning the offical statistics about the distribution of counted religiousness (or membeship in offical religious organisations) in Germany. Many will say that seems to be true, obviously. Yet, the Catholic church in Germany itself says just 28,2% of the inhabitants of the whole country are counted as Catholic overall in the first place and the church itself considers most of its own members as just pro forma members ("Taufscheinkatholiken"), citing a church service attendance of just 9,8%. Dresden is not that much more atheist compared to either Poland or Russia or another place in Germany. Don't get this wrong: Believe in God is low. The numbers are difficult to compare but the further East you go the less religious and the less Christian the inhabitants get. The de-christianisation of Europe is not uniformly distributed but more pronounced in the North and East. This process was accelerated only relatively mildly in former Eastern bloc states compared to the Western parts of Europe. The main factor is certainly the fact that Dresden was in the former German Democratic Republic. Like other West European countries, Germany in general is not extremely religious but the influence and attachment to Christianity is still more visible in the west (and possibly somewhat stronger in Germany than in, say, France or the UK). East Germany by contrast is largely indifferent to it. That's a simple fact not specific to Dresden but not generalisable to the whole of Germany or (Western) Europe. It's anecdotal but I know many people in France or the Netherlands who have strong attitudes, either positive or negative towards religion, devout Christians or militant atheists. By contrast, my East German friends simply do not care. Christianity has been made irrelevant, they grew up knowing nothing about it and do not even define themselves as atheists. It's just not a part of their life in any way. Exactly why some formerly Soviet-influenced or socialist countries (including Poland, Romania or Russia itself) experienced some sort of a return to religion while East Germany did not is an interesting question but there is no doubt that the current situation is linked to the history of the German Democratic Republic. It might be because the transition, while not entirely unproblematic, was generally easier in Germany than in Russia or even Poland. Speculating a bit, it might also be that outright “persecution” can have the opposite effect and prompt a form of reaction or resistance that keep some form of religiosity alive. By contrast, the East German regime had a policy of mild hostility that effectively marginalized religion. There is a huge gap between East Germany and West Germany and the more noticeable difference between these two country was the political movement in place. All the cities you cited belonged to East Germany. While many answers did already point out that there are many ways to measure the degree of "atheism", I'd like to make it explicit that the 41% in Russia and the 80% are most likely different measures. While the German numbers are likely from church tax records, there is no church tax in Russia, so these numbers likely measure self-determined survey answers. Not the answer you're looking for? Browse other questions tagged religion germany demography statistics or ask your own question. When did the majority of Americans stop living on farms? Are there any examples of overpopulation?